Back in May I set a fairly lofty target for Byte Night 2013: “This time next year, Rodney, we’ll be mill-yon-aires,” I said, barely containing my mirth. Regrettably, not a single person in the room was named Rodney and the joke fell a little flat. It wasn’t even a joke! It was just, you know, the sort of thing you say, a throwaway comment. It was nothing. Nothing. Forget it. Anyway, the point I was making was this would be the year Byte Night would raise more than a million pounds in one night. I had good reason to make such a bold prediction. Last year we came agonisingly close, raising £960,000. In 2013 Byte Night has grown, adding events in Manchester and Birmingham, to sleep-outs in Belfast, Cambridge, Edinburgh, London and Reading. It would, therefore, be a matter of course, surely? Four months later, where do we stand? We have encouraged more than 1,446 people to join us on the night of Friday 4 October, which is a huge achievement in itself given the torrential rain that plagued the majority of events last year. So far, so good. But how close are we to that million-pound target? To date we have raised more than £440,000 thanks to the incredible hard work and creativity of our Byte Night supporters and the IT industry. This year people have gone to incredible lengths busking, swimming round islands, climbing mountains, racing go-karts and playing football, to raise much needed cash for vulnerable young people at risk of homelessness in the UK. Knowing that we can call on this support is what keeps Byte Night growing year-on-year. There is still a long way to go and while we are equally confident that we can rely on our supporters to help us smash our fundraising target, we are going to need everyone to dig deep one last time. The money raised will help Action for Children projects across the UK to provide vulnerable young people with the support they need to help get their lives back on track. The money you raise will give them the space and security they need to work out what they want from their future and steer them away from the dangers of a life spent on the streets. If you need any more convincing, I suggest you take a look at the Byte Night Dream Catcher, which contains the stories of just handful of young people who have been helped by Action for Children projects across the UK. So if you are joining us on Friday, or know someone who is, please help us to make it a truly memorable night and save me from looking like a right plonker. Again. 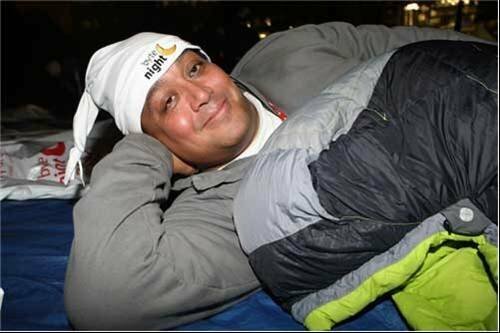 Visit www.bytenight.org.uk for all the details of how you can help support the IT industry’s charity sleep-out.